Did Wonder Woman Deal With This…? Likely not. No one ever told me she was a knitter…but if she was, would she lose all sixty-four stitches as she’s about an inch from finishing the foot so she can begin the toe? I somehow doubt it. She’d probably have a super-secret method of returning the stitches to the needles. Perhaps just put in a life-line, which i have not started using yet. I probably should use a life-line, those little contrasting pieces of thread that mark places and minimize damage. 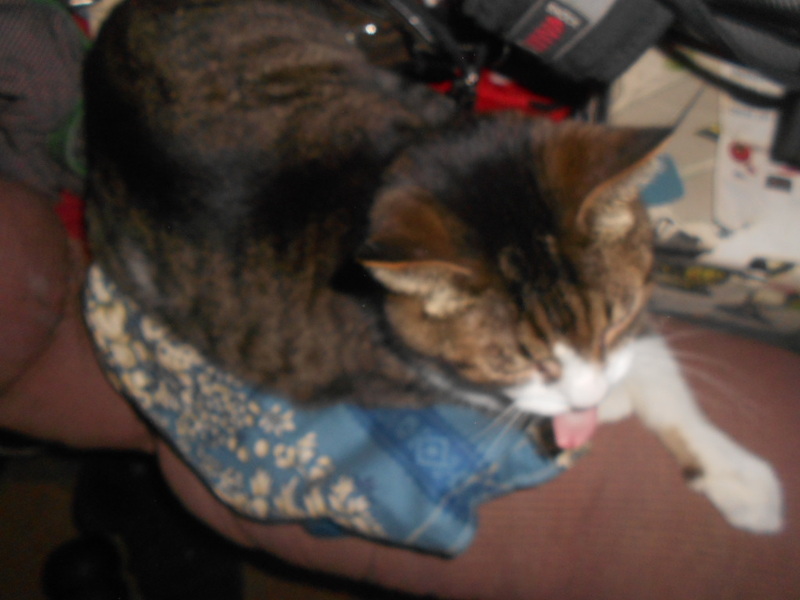 Putzer, guarding my knitting bag, with attitude…He deserves a massage for his efforts, after all. 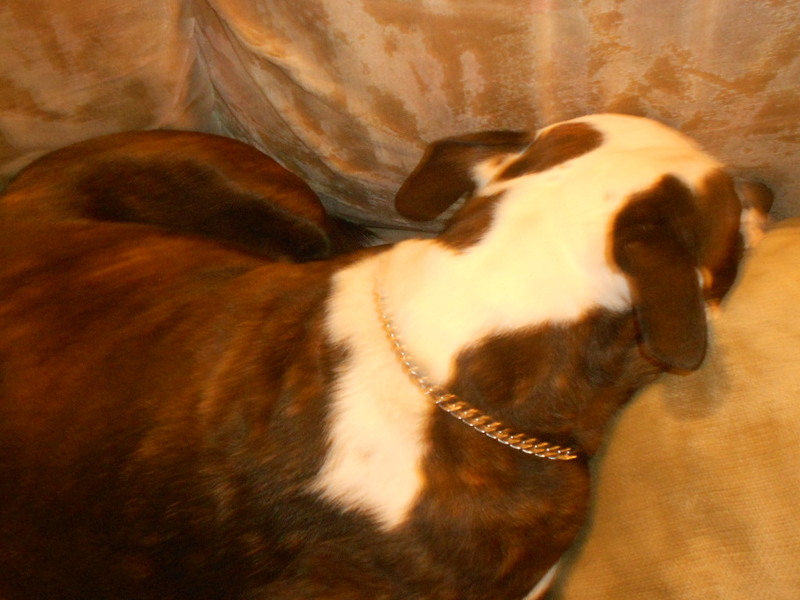 I sat down and let the dog snuggle in next to me, as he does sometimes while I knit. Except when I picked up the knitting needles, all of the stitches slid off. Oh, the horror! 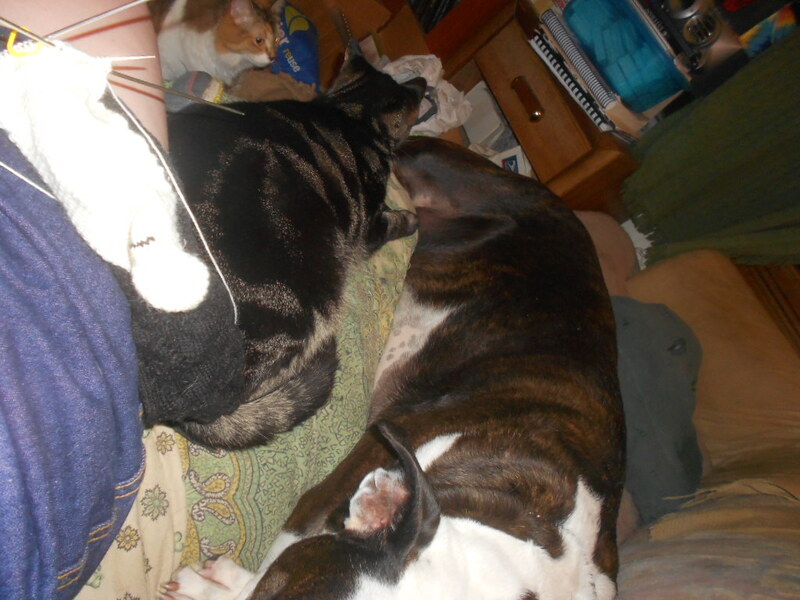 ALL 64 stitches were now exposed to the elements-air, cats, dogs, me! I needed to get these stitches back on the needles, 5 minutes ago. I hoped not to lose any of the stitches, but I did lose about eight of the cream colored stitches. Oy, and vey…or other sentence enhancing words of your choice. I had many of them. I also include “Don’t talk to me,” and “Go away,” for my Dear James, who was in a chatty mood that evening. The poor guy, he took it so well when I pulled out both tonight, in no uncertain terms. I work every night he does this week. I also wanted these socks done and ready for work this week. 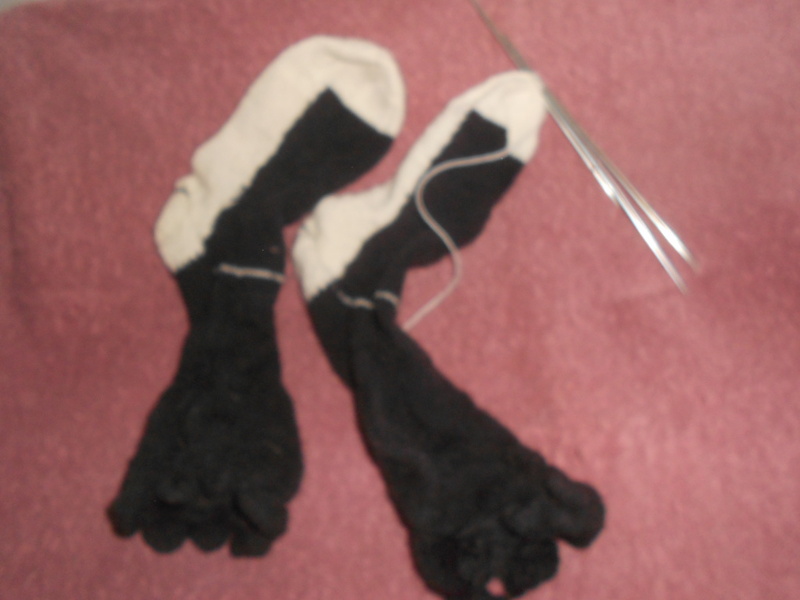 It also looked doable…before the socks came off the needles. I wasn’t even at the toes yet. I spent a stressful twenty minutes placing the stitches back on the needles, in a near silent home, and the poor dog lay on the floor waiting for Mom(with the big, deep, in charge voice) to relax. Once I got the stitches back on the needles, I started knitting and let James know that he could once again chat with me. Now, a while back, I admitted that I sometimes like to knit alone, especially when I’m at a tough part of the pattern or a spot that requires concentration. Dear James was home and was in the mood to chat. He even kinda wanted me to chat with him. This is a good thing that I wish to encourage, usually, especially if he’s playing video games. Except when I’m knitting, and I’m close to the toe, and ready to finish that blasted sock…and soon, I get to put away the black yarn until the next pair. And, well, I just placed all sixty-four stitches back on the needles. We worked through his chatty phase and the dropped stitches, and I began the excitement of re-joining the socks in the round and finishing the cream colored toe. So, just how did I make my socks so unique? Well, I’m good at finding challenges. Sometimes, I make them work. This time, I knit and purl the socks almost if they were flat, and every three to four rows, usually, I joined the two yarns. This join was accomplished by inserting the needle into the first stitch of the cream or the last stitch and wrapping both colors of yarn around the needle, then pulling through, leaving a two-color, two-stranded stitch that I worked as one in the next row. I tried to get good photos of my feet, and the happy ones showing how they will look for work. I do have a cream colored stripe on the top of my foot that does show slightly above my shoes, but my work pants should be long enough to cover it. Besides, we’ll just test how much they’re looking during one of our busy weeks;-). See, I’m never really alone with my socks. Zeus must see what the fuss is all about. This pair is happily now off the needles. I’m going back to pink yarn soon and debating about what the next pair of black socks will look like. I will talk more about the foot test next week. 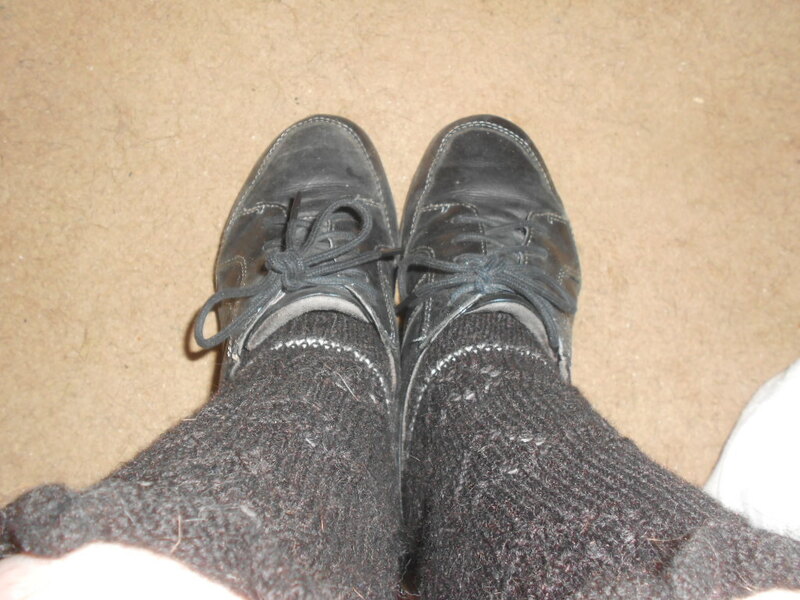 What my feet will look like as I go to work this Thursday evening…’Course I’ll be wearing black slacks instead of shorts. …I keep a spare set in a bag, just in case. I simply forget where I store it often. Last week, or the week before, I’d entirely lost my marbles. 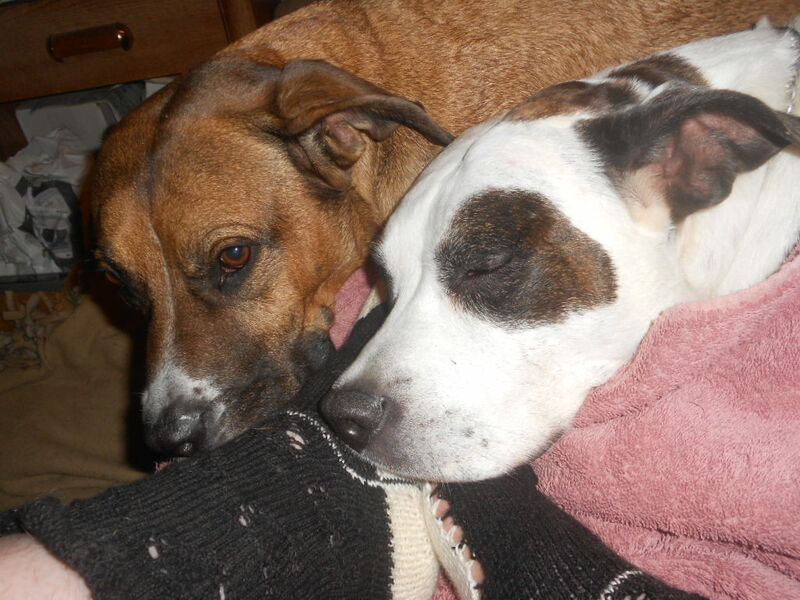 This week, it seems I was on the track to finding them, once I opted out of needing them. I looked at the training I was going through, which required a serious time commitment as well as invading on important plans I had in place for months. I still went through with the plans, trying to schedule around them, but to little avail. In the end, I decided my best friend’s birthday and my sanity(in part) were more important. I drove the hour and a half from work after my tenth day of reporting for training, to Grand Rapids, MI to visit my best friend and deliver her a birthday gift. I’ve had to only hint at this gift on the off-chance she read this blog. Now I can finally tell you what it is: socks! It sounds unexciting, unless you’ve worn hand knit socks. 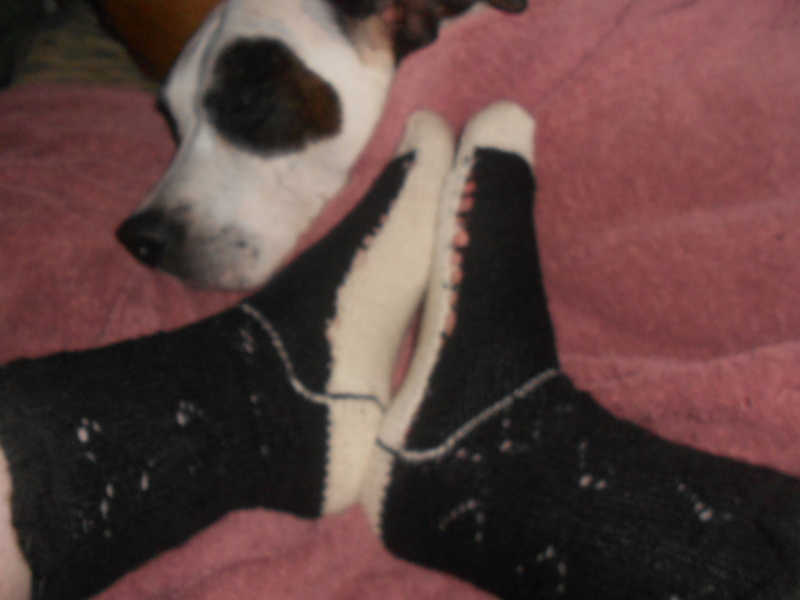 In addition, I did not knit her a pair of socks, as it takes long enough for me to knit each pair I get to wear. Someday, I will move into the world of knitting for others. Just not this year. Alas, I bought her a sock loom and took my little into the little world of wonder that is my local yarn store and we picked out some bright pink sock yarn. Photos shown below. 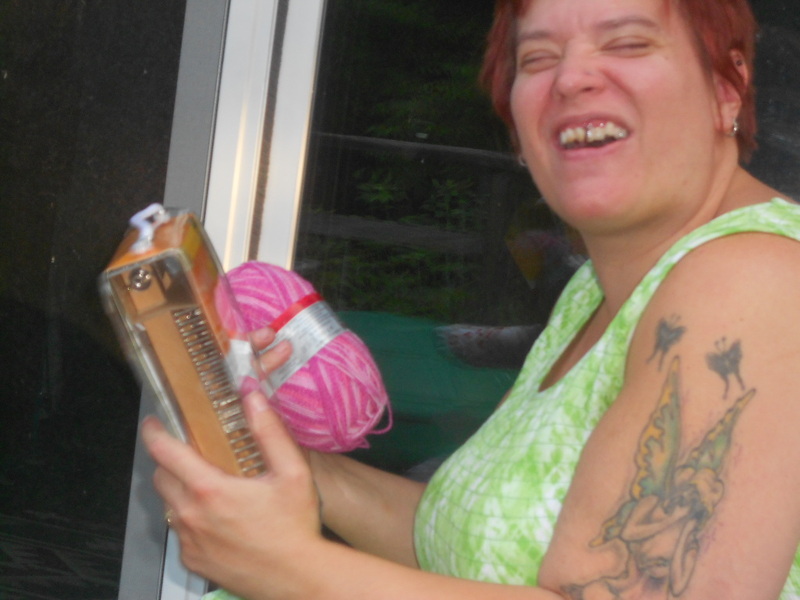 Andrea with her sock loom and yarn (the good stuff). Taking my little into the yarn store was an education in itself. She wanted to touch everything. I may have a future knitter on my hands. Yeah! The sock loom may be another education in itself. 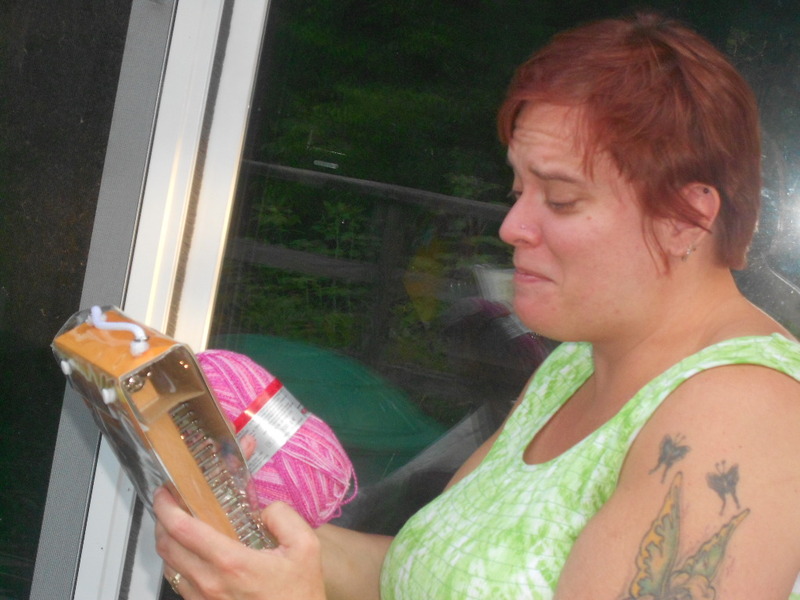 I’ve tried to show her how to knit with dpns, and she just doesn’t get it. I also considered showing her circulars, but she just doesn’t get the basic knit stitch. It works easier on a loom with a hook for her. Now she’s getting used to a smaller scale yarn. I’m sure she’ll make some beautiful socks. I can’t wait to see how they turn out, either. 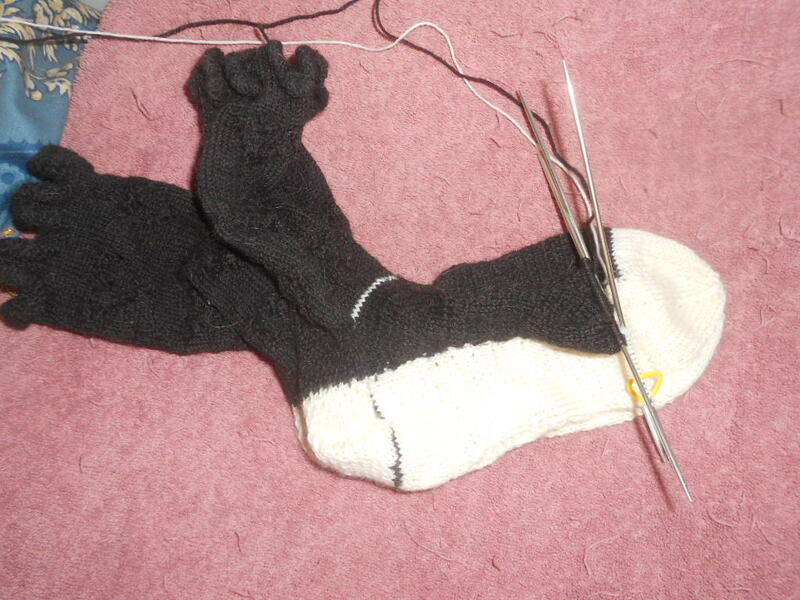 In the meantime, I’ve been working on my second sock for the black-hearted socks. The heel is turned(and yes, I was mostly alone when I knit it), and I am now attempting to recall how I joined the two colors in the previous sock I knit. I’d better do some checking. 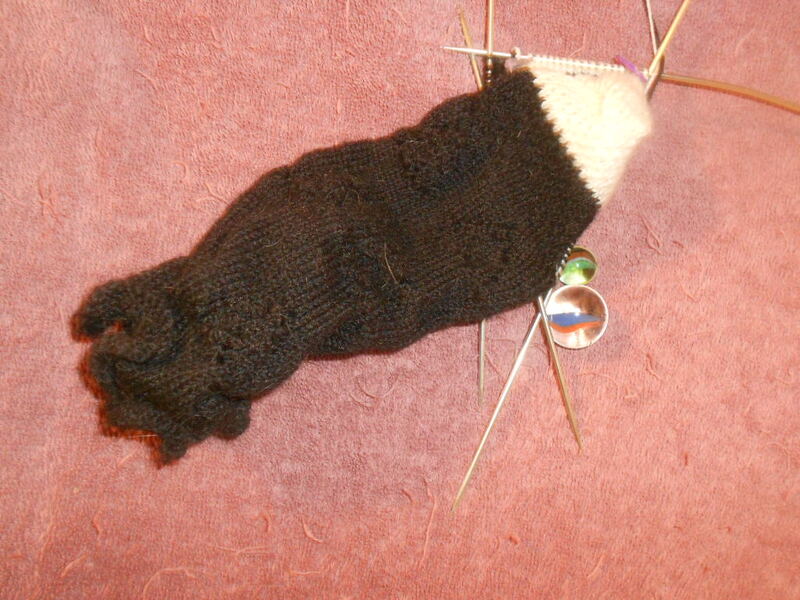 Current progress on the sock, and proof I still have a couple of my marbles…some days;-). This next week will be a busy one with a semi-private birthday party for my little, Mariah and myself, to which my nieces are invited. I will also have my nieces overnight. Later in the week I will be helping a friend by watching her four kids while she attends a daytime meeting. But this doesn’t begin to cover the fun I’ll have working on the fairy garden with my dad and sister-in-law and likely, my nieces, the following week. However, as I was gathering supplies for the fairy garden we’ll be creating, I found a bag of marbles I could have used last week! At least, I’ve found my marbles for the time being.